So here it is, then – Day 7 of the 44th Mini Ludum Dare. As this is a 7 Day RTS compo, that makes this the final day – and about time, too, since I really need a break. I am, therefore, done – here is my first LD submission. 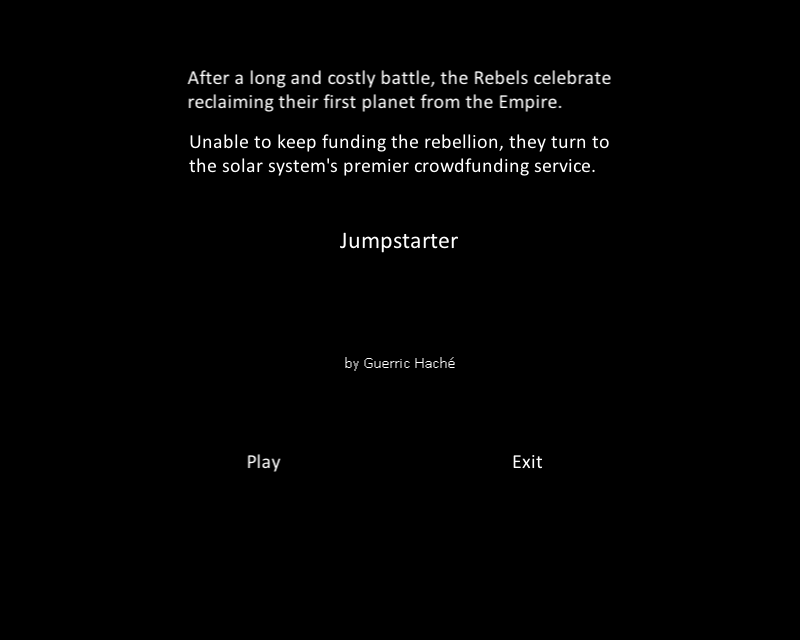 My game, Jumpstarter, is nominally about taking the reigns of a rebellion against an Empire, using crowdfunding (tied to public approval rating) and trade route raiding as a main source of income. 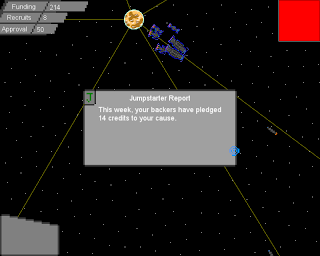 In point of fact, the theme is rather thin; most of my work was concentrating on coding a working RTS, and in that respect, I think it’s a moderate success. 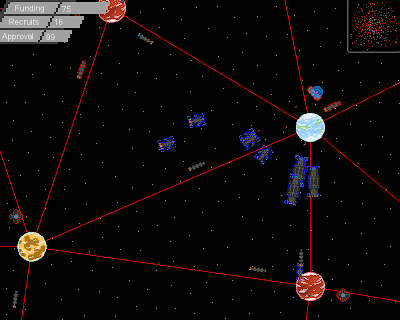 There are several issues remaining – not as many selection modes as I’d like; a bug that crashes the game if you exit to the main menu and try to start it again from there; homing missiles are a little wonky; and the balance of the enemy AI is iffy at best, swinging between hilariously incompetent and ruthlessly efficient. I played against the AI’s current design and won a few times, but I am generally terrible at RTS games (despite them being a favorite genre), so I upped the difficulty a little bit above my level before uploading it, and I can’t consistently beat it as it currently stands. Also, ship costs are mostly arbitrary, and are probably not properly balanced. 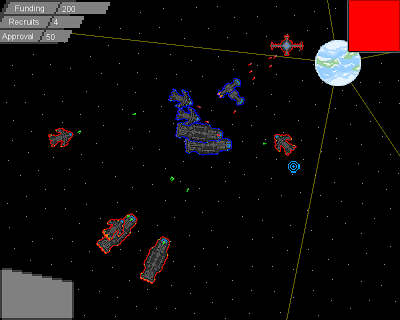 The game uses fairly standard RTS controls. You drag-left-click to select all units within a box, or single-left-click to select one unit. Mouse wheel zooms in and out, WASD pans the camera around.. Right-clicking issues orders, either to move, attack or invade. To win the game, you must capture all the red Empire’s planets; to lose, you must lose all your planets and ships – that is, you can live on if all you have are ships (but you effectively cannot win if you have neither planets nor Dropships, since you can’t capture any planets). 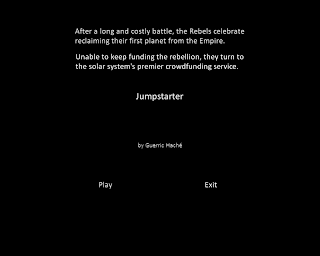 Tomorrow, I will consider doing a more exhaustive post-mortem on how the development of Jumpstarter went, but for now I need some rest. Good night everyone! This is great. Tomorrow, then, I will focus on solving the game’s remaining problems, including a fixing a few bugs and adding missing features regarding unit selection; softening the extremely difficult enemy AI (the AI doesn’t even cheat! If anything, it is handicapped. ); adding more sound and particle effects; balancing unit costs; fixing population limits; and generally fixing bugs and trying to track down and prevent the mysterious random crashes I experienced earlier today. Good luck to everyone else on the last day! Cross-posted on my personal website. Today I managed to get lots of little tweaks done, such as fixing crashes, implementing population limits, fixing bugs, adding the minimap and tooltips, and adding particle effects and more visual feedback, and so on. The game is basically playable, with the glaring exception that the AI is not yet implemented. I’ve started working on the basics, but it’s rather daunting, as I’ve never done anything like this before. The weather was also awful today, sunny the entire time, and as a result I feel like I’ve been beaten up by somebody with a hot iron, so I wasn’t at my most productive. I’m going to try and get some extra sleep tonight, and hopefully wake up fresher and able to tackle the problem that is AI. I’ve got two days to get it done, really, though I’d like to continue tweaking the game and adding gameplay features as well. So today I had very little time to get things done, compared to the rest of the week so far. 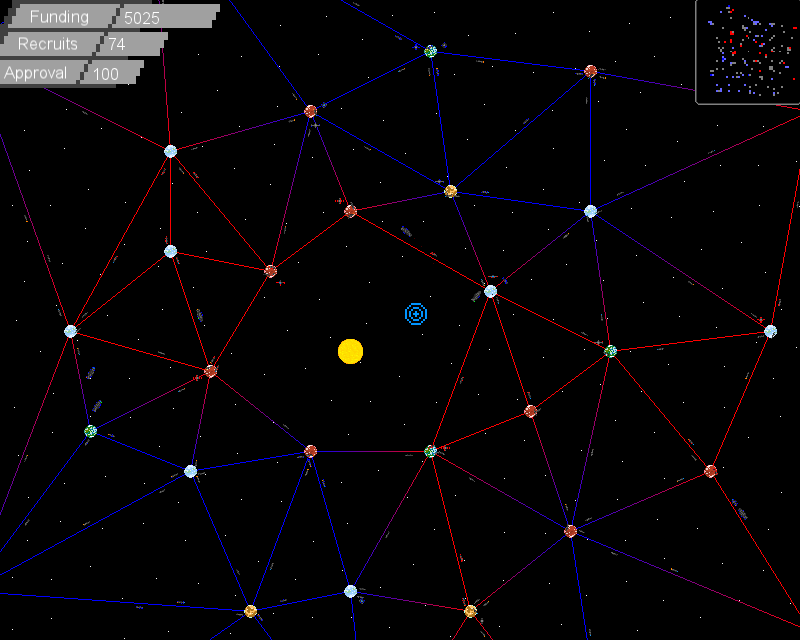 I managed to get unit production up and running without much trouble, though, and also implemented planet capturing. That means that the fundamental ingredients of the RTS game here – unit command, territory control and economic management – are in! Yay! Unfortunately, I am going to bed tonight with an unsolved crash related to particle effects. Hopefully my fresher eyes tomorrow morning will help solve that. Afterwards, there is some tweaking to be done, particularly to the interface, but the last major feature to add is enemy AI. I hope to get basic enemy AI implemented tomorrow, as well as interface fixes and improvements; and I hope to get complete AI and basic sound implemented by Saturday night. Sunday, then, will be a day for adding fun extra features, if all goes well. I’m really enjoying the #7DRTS so far, but it is a definitely a bit exhausting, and I look forward to a code detox once this is over. At that point, I think I’ll sit down and play Shadowrun Returns. So I decided to slightly tweak the theme of my game. Only slightly. Now, it’s not just “public approval” you are gunning for; that public approval is reflected in the revenue pulled in by the crowdfunding campaign you are running to fund the rebellion. Correspondingly, it is no longer called Insurrection, but rather Jumpstarter. Otherwise, today has been a productive day, but sadly not as productive as I would have hoped. I managed to get trade routes and resource gathering up and running, tweaked combat code a bit, and I’ve started implementing the interface structure for unit construction, but I haven’t actually started implementing unit construction yet, which is a big deal. I was hoping to at least get started with that. Still, there are 4 days left in which to implement production and enemy AI before getting to the more unique stuff, as well as possibly polish (though frankly, I don’t think I’ll have time for much of that). Tomorrow will be ugly, because I have a really full day of classes, but I’m sure I’ll find a few hours to work on the problem, and starting Friday things are calmer. So the second day of MiniLD #44 draws to a close, and I have made some good progress today. First, I added a lot of art to the game, though it is still pretty fugly. I also tested out an equally fugly random music system I had lying around somewhere. We’ll see what comes of that. 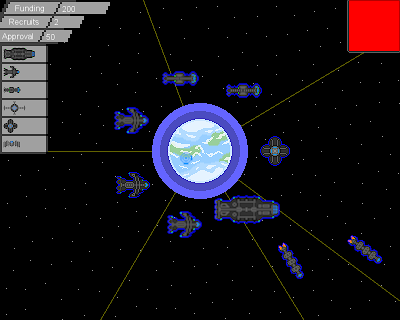 On the gameplay side, I implemented combat and an enemy faction, space stations, and the fundamentals for resources (no spending or gathering yet, just numbers, functions for changing those numbers, and interface elements), and the fundamentals for collision detection, though for now the only meaningful uses of that are 1) tracking where shots fall, and 2) scanning for nearby enemies. Tomorrow, my goals are to get trade routes, production, and resource collection up and running, and maybe implement some rudimentary enemy AI (i.e. enemy player AI, not enemy ship AI, which already exists). If I have the time, implementing placeholder sounds for things like weapons fire and ship explosions might be nice, as well as implementing the graphics for ship explosions. Good night, and see you all tomorrow! GarrickWinter here, ready to start my #7DRTS as soon as I wake up! The goal is to make an RTS game in 7 days, and I love RTS games. Not to mention we are allowed to use pre-existing code, and have 7 days, so unlike a normal Ludum Dare I actually have a hope in Hell of getting something done. Once I get up tomorrow, my 7-Day RTS odyssey will begin! I hope to blog a little about my progress each day, though it’s hard to say whether or not I’ll have the time. I will also be cross-posting on my personal blog. I will be using some code I wrote previously for handling importing graphical assets and moving sprites around, as well as some code for playing sounds and for generating Voronoi diagrams. My first order of business, tomorrow, will be pulling that code together into a seamless whole for use as the base of my game. Insurrection, a space-themed RTS game about taking down an Empire while managing public approval of your rebellion. …LMMS for sound?… we’ll see. So starting tomorrow morning, it’s full steam ahead! See you on the other side! Good luck everybody, and have fun!